The Thermalright TY-143 fan has been designed to provide excellent performance and high airflow. It is PWM controlled to provide great flexibility. The fan is designed for users who wish maximum cooling performance in extreme situations. The TY-143 generates at the maximum rotation speed of 2.500 rpm an air flow of up to 130 CFM! Naturally, a fan with such a high rotation speed will generate corresponding noise – the maximum sound volume of the TY 143 is specified at 45 dB(A) at maximum speed. The extremely wide control range of the fan between about 600 and 2,500 rpm means, that the noise level of the fan during normal operation will be quite acceptable at approx. 21 dB(A). Thanks to the PWM control, the fan automatically adjusts to the individual circumstances. 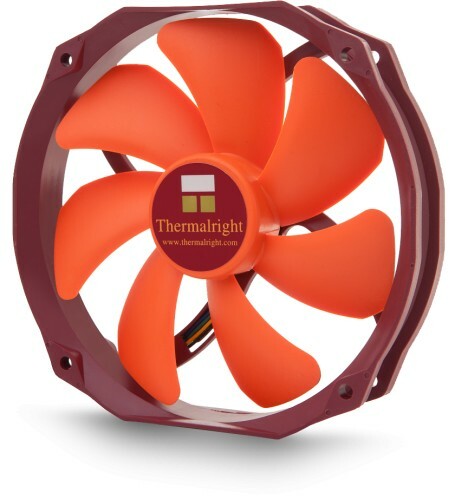 The Thermalright TY 143 has the dimensions 140 x 152 x 26.5 mm, the mounting points are identical to those of conventional 120 mm fans. Owing to the sophisticated design of the inner diameter of the fan is even slightly greater than that of a conventional 140 mm fans (! ).The truncated frame of the fan can be mounted at various coolers that are designed for standard 120 mm fan. A requirement is that the fan is mounted directly on the side facing the heat sink. Fan brackets which engage over the entire frame are usually incompatible. When using it as a case fan you should examine whether sufficient space is available to the side. The TY 143 features a double ball bearing, which guarantees a particularly high durability.